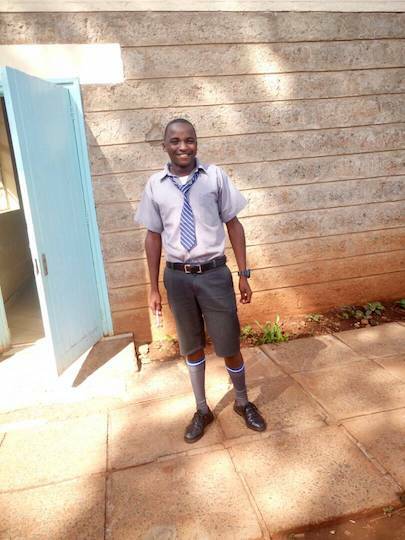 After working very hard in primary school, Emmanuel’s dream of joining secondary school evaporated when his parents abandoned him to find jobs on an estate in Nairobi. Fortunately, a teacher at the Mary Leakey Girl’s High School took notice of Emmanuel’s impressive grades and positive attitude for school. The teacher took him in and had him admitted to a nearby government primary school. He now lives with the teacher full time. Emmanuel is doing very well in school, and his foster parent has been searching high and low for help for him to join secondary school. He is a well-rounded student who enjoys playing all kinds of sports. He is a curious student with excellent leadership skills. He is also very sociable and does not let his situation dampen his spirits. Emmanuel says he hopes to help his family out of poverty with his education. He hopes that in a few years’ time, he will be able to make a decent living and send his younger sisters to school. Emmanuel is eligible to join secondary school next year. He is a good student and he needs financial support to join secondary school. Help Emmanuel attain a bright future by sponsoring his secondary school education.